When Eve Anderson meets Adamo de Leone on a ship bound for Europe, she has no idea of the dark secret that will endanger both their lives. She accompanies him to his home on Italy’s Amalfi Coast to open an inn left to him by his grandfather. But then she learns he spent five years in prison for a crime he claims he didn’t commit. Could the man she loves be responsible for embezzling eighty million dollars from the investment firm he once owned? Adamo wants to hold Eve at arm’s length until he can clear his proud family name. But when there is an attempt on his life and Eve is terrorized by a gun-bearing thug, he realizes how much he wants her, and he must accept whatever help he can get to uncover the well-hidden trail of a six-year-old crime. Blair McDowell is quickly becoming a favorite with readers of Romantic Suspense and Mystery. Her passion for writing is combined with her love of travel and exploring the world. Blair's thrilling tales are set in exotic and captivating places, which she uses almost like another character because of their intrinsic significance to the story. Beautiful cover on this book! There I said it. Sorry, but I had to. Fortunately, unlike a great many books out there, this cover reflects what the story is about inside. I just adore the Amalfi coast where this story takes place. I’m not one for straight romances, but good ones, great ones always attract my interest, especially romantic suspense that keep the pages turning. This one did that right away from the opening scene. Unfortunately, after the first scene, I was able to guess what would happen next. No surprises there, which disappointed me greatly. I hate predictable books. That’s the problem I have with typical romance books. Fortunately, once I delved into the story after that, I grew to enjoy it, and though, the character names Adamo and Eve are far from original for a romance, one disregards that trite fact once the reader delves into the story. 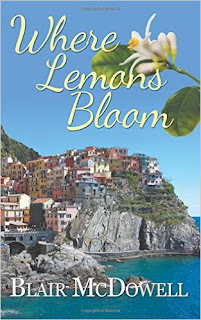 I found I truly enjoyed Where Lemons Bloom by Blair McDowell and will be looking for other books by her. If you’re a traveler via armchair, or your chosen mode of transportation, this book combines vivid traveling with a romantic suspense. All in all, I highly recommend this book for any fan of romance, suspense, travel and mystery. You won’t be disappointed. Disclaimer: I received an ARC from Reading Alley in exchange for a fair and honest review.